for over 20 years. He studied in Canada, the US, and Europe and has performed at over 500 events. Canadian musician Kevin Budd has specialized in the pan flute as both a composer and performer for over two decades. A consummate wind musician, he also plays transverse flute, and recorder. 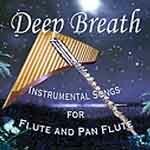 An ancient instrument, the pan flute is used, in some form, throughout much of the world. According to Greek myth, it was invented by the god Pan as an instrument of consolation. The Romanian-style pan flute or nai played here has a single line of bamboo tubes which produce an extraordinarily clear, natural and haunting sound. Kevin Budd is North America’s most renowned builder of professional pan flutes. He has taught at the Arosa Music Festival in Switzerland, performed as a soloist with regional orchestras, and has played for movie soundtracks, commercials, and recordings. Mr. Budd has brought together the international pan flute community with the first Internet web page devoted to the instrument, and its first Internet-based discussion group, Pan Flute World. Kevin is currently purusing a Doctorate in Ehtnomusicology. Kevin lives in Toronto, Canada, and is available to perform for special events. His lovely sound adds a unique, lovely ambience that is very memorable. Copyright Kevin Budd, Design by Bryan Lass, IdaVista, Inc.